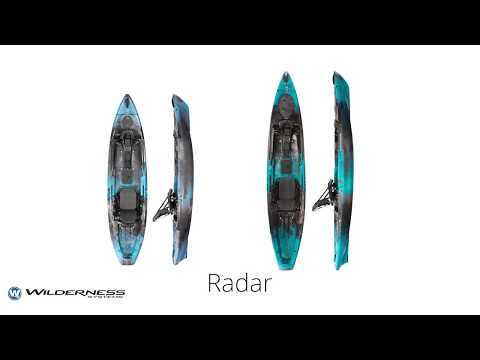 The Wilderness Systems Radar 135 is an exceedingly versatile fishing kayak. 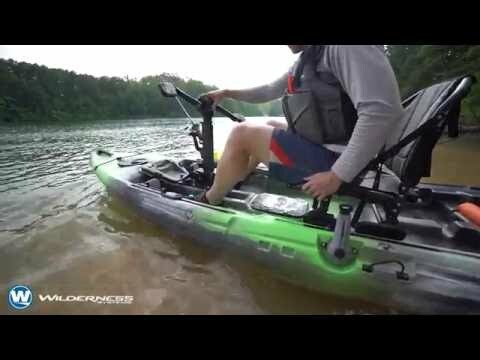 It can be paddled with a traditional kayak paddle, pedaled with the new Helix PD Pedal Drive, or powered by the Helix MD Motor Drive. The SMART hull technology combines stability, maneuverability, acceleration, responsiveness and tracking for optimal performance in multiple water environments and configurations. Design elements include an upswept bow for a dry ride, a defined keel line for excellent tracking, a rockered chine for responsive steering and a flat, stable platform for standing and freedom of movement in flat to rough water. The Radar features state of the art outfitting including the SlideTrax rails, multiple storage hatches, and generous rear tankwell storage. The AirPro Max seat is as comfortable as it is functional; its quick-drying, breathable mesh fabric won't fade in the sun, the quick-adjust levers let you slide the seat fore and aft, and it can be stored vertically to open up the deck for stand up fishing. Took her on her maiden voyage last week. I can't express how stable this kayak is. Stand on top is more like it! I've owned a few different paddle kayaks. I ended up getting a Ride 135, and it was the best all around fishing kayak in my opinion. I naturally wanted the Radar 135 and I'm glad I got it. For obvious reason it was an upgrade to the Ride 135. Similar features with some added to improve the hull design. The helix pedal drive is comfortable and a game changer over paddling. The low deck design should help in windy conditions but still leaves a vast amount of room on the deck to move around. The airport max seat is unbeatable and overall the kayak is one of the best looking on the market in my opinion. Definitely happy with the purchase and ACK was helpful with all my questions as always. I don't know if I'll ever switch from a Wildy Kayak! Pros Stable Tracks pretty straight Plenty of storage Stable Comfortable seat Cons Heavy Not fast at best 3 mph but more 2.5 mph average No cup holder Internal molded in grab slots are useless in lifting this kayak. Q: Does the peddle system for this kayak go in reverse as well? A: Hello, The peddle drive system will operate in reverse. Q: The Radar 135 is 95 pounds without the drive, is that correct? What is the weight of the layak without and with the drive? Thanks. A: Hello, yes this kayak without any drive is going to be 95 pounds, and with the drive it will weigh between 107 and 110 pounds depending on which drive system is used, with the motor drive weighing more than the pedal drive. Q: Does the weight of the kayak listed here include the seat? A: Yes, it should include the weight of the kayak with the seat. Q: Is the deck sufficiently supported or made with a more thick plastic to effectively support a 250 plus pound standing angler with out deforming? A: Most kayaks at this width will have a little give to the deck. The wider the kayak, the more stable you will be, but you'll also experience a little more flex to your deck because of the width. 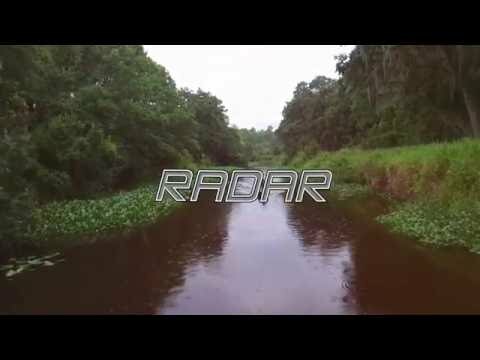 Q: I have read comments from a few users that the deck on the Radar has a little give and flex to it. How sturdy is the deck? Especially compared to other units such as the ATAK and Ride? A: Most kayaks at this width will have a little give to the deck. The wider the kayak, the more stable you will be, but you'll also experience a little more flex to your deck because of the width. So, the ATAK and Radar are both very similar in stability, but I have found the ATAK to have a more sturdy and less flexible deck. Q: Can you buy a rudder for it with the hand control knob, like the one in the video? Have not seen one. Have only seen that it comes with the Helix PD. A: Wilderness Systems doesn't offer a rudder kit with the hand control steering unless it's with the pedal drive. A: Yes, the price does include the rudder. The Wilderness Systems Helix Pedal Drive includes the rudder kit and hand control steering knob. A: This kayak doesn't come standard with a rudder system installed, so you would need to purchase another to have it included on this kayak. Q: Does the kayak come with the pedal drive system?